Classic style meets rustic charm in this beautiful dresser. The soft white driftwood finish highlights the shutter style panels that are the hallmark of the Newcastle style. Convenient features like felt lined top drawers combine with quality elements like dovetailed drawer construction for a beautiful and practical piece. Constructed with solid hardwood and birch veneers. 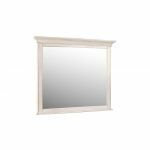 Classic style meets rustic charm in this beautiful mirror. The soft white driftwood finish highlights the shutter style panels that are the hallmark of the Newcastle style. 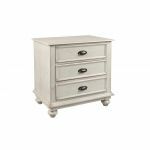 Classic style meets rustic charm in this chest with a soft white driftwood finish. 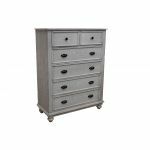 Convenient features like felt lined top drawers combine with quality elements like dovetailed drawer construction for a beautiful and practical piece. Constructed with solid hardwood and birch veneers. Classic style meets rustic charm in this night stand with a soft white driftwood finish. Convenient features like felt lined top drawer and USB charging ports combine with quality elements like dovetailed drawer construction for a beautiful and practical piece. Constructed with solid hardwood and birch veneers. Classic style meets rustic charm in this beautiful bedroom set. The soft white driftwood finish highlights the shutter style panels that are the hallmark of the Newcastle style. Constructed with solid hardwood and birch veneers.